Then Marcus Abbott (ArcHeritage) and Hugo Anderson-Whymark (freelance lithics specialist) analysed the data, created new digital images and news ways of seeing them, added some of their own photos and spent time amongst the real stones. In one sense the results are not surprising: it was obvious to anyone with eyes that that we could learn a lot about Stonehenge with a proper study of the stones. And yes, we have learnt a lot. But just about all the details are revelatory. graffiti: dates range between 1721 and 1866, though most were carved 1800–1850 – and they’re almost everywhere. And this must be just the beginning. There are more details yet to see (there is still scope for new and higher resolution survey), and new things to think about in the vast data set. If you know Stonehenge, from this alone you can see at once how much new information has been revealed. 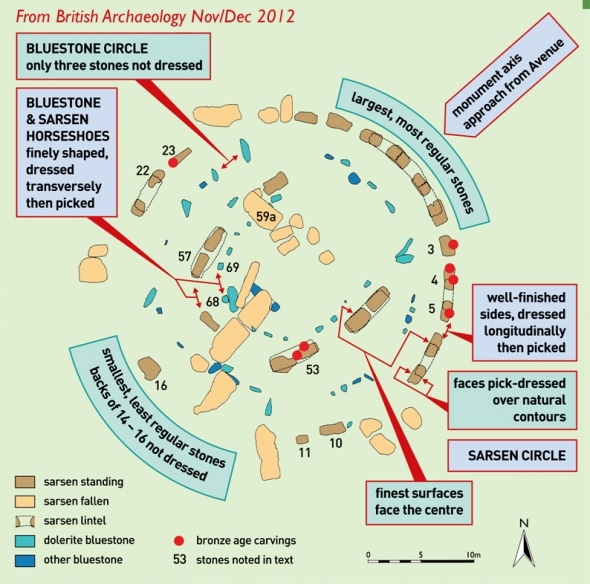 Amongst other things, it seems fair to draw from this (and other new data) that the sarsen circle probably WAS complete; and that the whole thing was designed to be seen from the north-east, approaching up the Avenue – so the implication follows that the setting midwinter sun you’d be facing to the south-west was the key alignment. 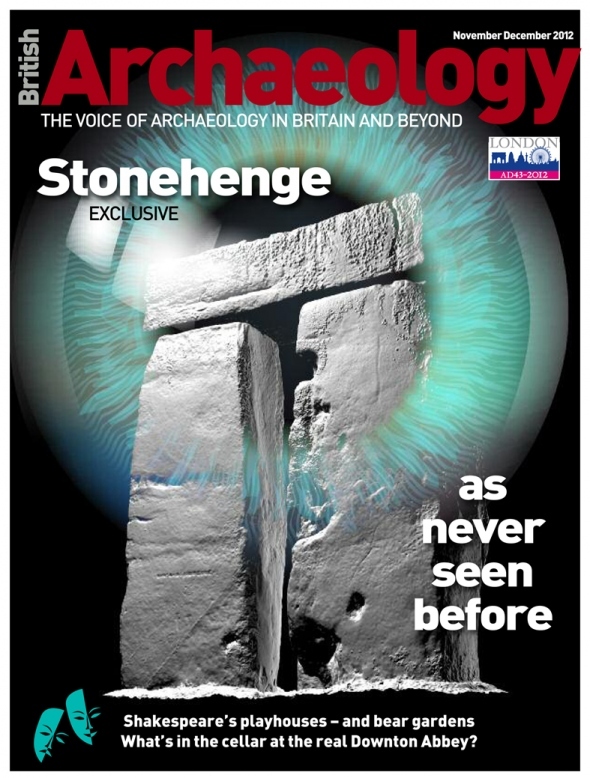 British Archaeology also published the pioneering Stonehenge laser study done in 2002. 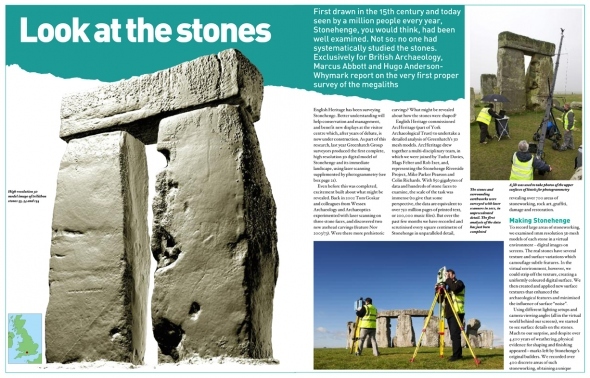 The Council for British Archaeology’s award-winning bi-monthly magazine is the authoritative, in-depth source of information and comment on what’s new, interesting and important in UK archaeology. Visit Stonehenge on the summer solstice of any year and you’ll see 20,000 people partying in and around the ancient rock formation. The crowd is usually made up of around one third tourists, one third pilled-up teenagers in sportswear, and one third neo-druids. It’s a genuinely bizarre sight. Don’t get me wrong—I enjoy chewing my own face off at archaeologically significant sites as much as the next guy, but in a time when British disobedients seem to spend more time in police kettles than they do in squats, you have to wonder how all of this is, y’know, allowed. Stonehenge News Blog sponsored by ‘Stonehenge Guided Tours’ www.StonehengeTours. 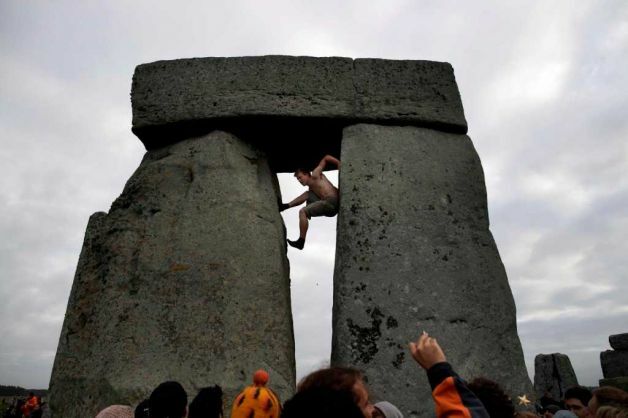 Visiting Stonehenge for the 2012 Summer Solstice ? Use it, Don’t abuse it! Respect the Stones and Respect each other! Stonehenge is an ancient pre-historic site. It has been a place of worship and celebration at the time of Summer Solstice since time immemorial. Use it ! Dont abuse it! 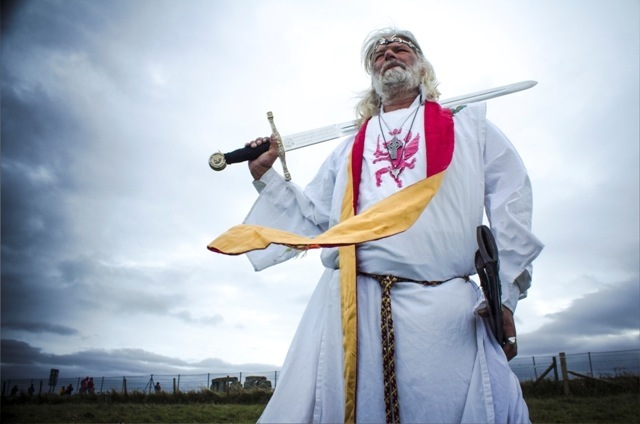 SOLSTICE CAR PARK OPENS 1900 hours (7pm) Wednesday 20th June ACCESS TO STONEHENGE 1900 hours (7pm) Wednesday 20th June LAST ADMISSION TO SOLSTICE CAR PARK 0600 hours (6am) Thursday 21st June STONEHENGE CLOSES 0800 hours (8am) Thursday 21st June SOLSTICE CAR PARK TO BE VACATED 1200 hours (12 Noon) Thursday 21st June – see the pages on Travel and Parking for further information on travel and parking arrangements. Stonehenge is approximately 2½ miles (4 kms) from the town of Amesbury. The nearest bus and railway stations are in Salisbury, which is 12 miles (19 kms) away from Stonehenge. As the roads around Stonehenge will be very busy, it is recommended that you leave your car at home and travel to Stonehenge using public transport. A high volume of traffic is anticipated in the Stonehenge area on the evening of Wednesday 20th June. The Summer Solstice parking facilities close to Stonehenge are extensive but also finite. Although traffic, as you approach Stonehenge, maybe slow, please do not be tempted to abandon your vehicle and park it either on the A303 or other neighbouring roads and public rights of way. Cars parked illegally will be towed away by the Police or Wiltshire Council. Please also be aware that a number of road closures will be in operation to ensure safe pedestrian passage to Stonehenge and to allow unimpeded access in the event of an emergency. As you approach Stonehenge, signage will be in place to direct you to the Solstice Car Park. Please see Parking for further information. It is not advisable to bring cycles to Stonehenge as they cannot be accommodated at the Monument and they will not be permitted beyond the Solstice Car Park (which is located approximately 1 km west of Stonehenge). Please bring your own locking device and park your cycle in the designated area in the Solstice Car Park. Ask a steward at the Solstice Car Park entrance for assistance. Stonehenge is an ancient pre-historic site. It has been a place of worship and celebration at the time of Summer Solstice since time immemorial. 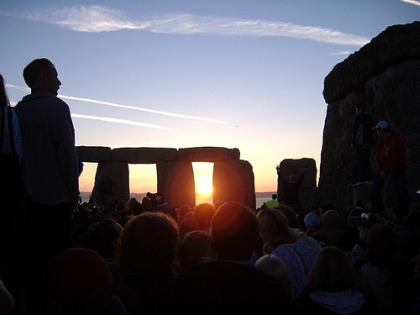 English Hege is pleased to be providing Managed Open Access to Stonehenge for the Summer Solstice. Please help us to create a peaceful occasion by taking personal responsibility and following the Conditions of Entry and guidelines set out on the following pages. We have a duty of care to ensure public safety and are responsible for the protection of Stonehenge and its surrounding Monuments. If we are to ensure that future access is sustainable, it is essential that everyone observes and abides by these Conditions of Entry. 1200 hours (12 Noon) Thursday 21st June – see the pages on Travel and Parking for further information on travel and parking arrangements. Drunken, disorderly, and anti-social behaviour will not be tolerated; ejection, possibly by the Police without return, will be the outcome. Only small amounts of alcohol for personal use will be permitted on to site. Alcohol is limited to no more than the equivalent of four 500ml cans of beer/cider or 75cl of wine. No further alcohol will be permitted on subsequent re-entry. Be warned, drug/alcohol cocktails can be lethal, so please be fully of aware of what you are doing. Illegal drugs are still illegal at Stonehenge as they are anywhere else. The police will be on site during the access period and will take immediate action against anyone breaking the law. Summer Solstice is not a good time to experiment with drugs – the crowd, the noise and the sheer size of the place are likely to make any bad reaction much, much worse. As much of the access is at night, if you had a bad reaction it may be difficult to locate you to administer treatment. Stonehenge is a world renowned historic Monument and it is seen by many who attend as a sacred site. Amplified Music is inappropriate and will not be permitted. Camping, fires, chinese lanterns, flaming torches, BBQs and fireworks are NOT permitted at Stonehenge, in the Solstice Car Park, or anywhere in the surrounding National Trust land. Please see Useful information for further details of local campsites. Do not climb or stand on any of the stones – this includes the stones that have fallen. This is in the interest of personal safety, the protection of this special site and respect for those attending. As well as putting the stones themselves at risk, climbing on them can damage the delicate lichens. In order to ensure personal safety, random searching may be undertaken, but we hope that self-policing and personal responsibility will prevail. Any items that might be used in an illegal or offensive manner will be confiscated. 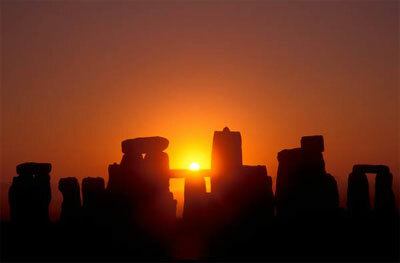 English Heritage is pleased to be providing Managed Open Access to Stonehenge for the Summer Solstice. Please help us to create a peaceful occasion by taking personal responsibility and following the Conditions of Entry and guidelines set out on the following pages. We have a duty of care to ensure public safety and are responsible for the protection of Stonehenge and its surrounding Monuments. If we are to ensure that future access is sustainable, it is essential that everyone observes and abides by these Conditions of Entry. 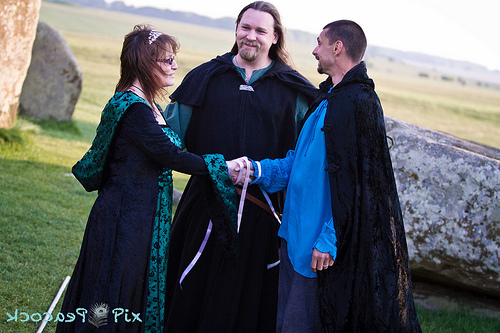 During the Summer Solstice access to Stonehenge, we support all individuals and groups conducting their own forms of ceremony and celebration providing that they are mutually respectful and tolerant of one another. It is a place seen by many as a sacred site – therefore please respect it and those attending. English Heritage continues to work closely with the many agencies and people from all sectors of the community and we would like to thank them for their help and support. For bookings, dog policy etc., you need to contact English Heritage, click here, the custodians of the site. For special access to the Stones (not during the Solstice), click here. The Avebury complex is a must on your itinerary and only a short journey, north, from Stonehenge. There is free, open access to the whole of this huge site. click here for more information. It may have been a site of ritual slaughter and Druidic practices but a new poll of the UK’s top romantic locations puts Stonehenge in second place overall but top in England, beating Windermere and King Arthur’s Seat. The Welsh coastline tops the poll with 24 per cent of those surveyed voting the secluded beaches of the principality as the perfect leap year proposal spot. The Cotswolds, with its picturesque stone cottages and countryside comes third. The survey, by PCH Prizes, also revealed that twice as many men as women voted for the turf of Wembley as their most romantic location. Stonehenge has been attracting the spiritual and the curious for 5,000 years and while it may now be deemed romantic for Dorset novelist Thomas Hardy it was a symbol of isolation. In Tess of the d’Urbervilles Tess falls asleep on an ancient stone altar at Stonehenge after murdering Alec d’Urbeville, not the kind of future that leap-year brides are planning. Merlin says “Happy Valentines Day, remember it is actually a Pagan festival! Imbolc is traditionally regarded as the first day of Spring. Life is beginning to stir again. The Celtic festival of Imbolc or Imbolg – pronounced without the ‘b’ sound – is sometimes known as Oimelc, means ‘ewe’s milk’ – named due to the birth of the first lambs at this time, and celebrates the return of fresh milk. Sheep are earlier with their offspring than cattle, because they could crop lower for grass and so thrive on the sparse vegetation in late winter. Cattle would calf around March. Bulbs are beginning to shoot and new lambs are born – the cycle of new life returns to the earth. Imbolc marks the rebirth of nature and fertility. It is the celebration of the gradual dawning of increasing light, bringing nature to life again. Nature is awakening from her winter rest – the long winter darkness begins to break as the daylight hours begin to get longer. Christians celebrate this festival as Candlemas. Imbolc focuses on the Goddess, both as Mother – as she gave birth to the Sun God at the Winter solstice, and as the Maiden. Brigit was originally considered a form of the Triple Goddess. Imbolc is a feast dedicated to the Goddess in her maiden aspect, in her guise as Brigid, Bridget, Bride, Brighid, Brigit or Brig – goddess of learning, poetry, prophesying, craftmanship, agriculture and healing. Imbolc is considered a traditional healing time and it is a good time to consider ways to improve your health. Brigid is the virgin goddess who brings new life to the earth. She is known as Bride in Scotland – pronounced Breed – which is the origin of the word ‘bride’. 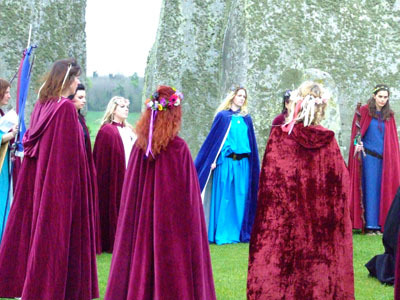 Imbolc is also known as Bride’s Day. She was christianised as St. Bridget of Kildare, the patroness of sheep and fertility, and she was also known as the ‘Mother of Ireland’. Briget’s Cross is woven from corn and consists of four arms that meet to form a square centre – a fire wheel. Imbolc is a ‘fire festival’. particular attention was paid to the hearth fire and keeping it alight. A celebratory dish used to be made from the new lambs’ docked tails. Bridie dolls are made out of a sheaf of oats and dressed in women’s clothing, and then ritually buried in the earth as a fertility rite. Another custom was to place the doll in a ‘Bride’s bed’ of woven wheat, like a basket, which was placed near the front door, or sometimes near the hearth. A white candle was burnt nearby all night. Spring cleaning comes from the habit at Imbolc of getting rid of unwanted clutter and preparing for the new season, physically and mentally. Now is the time to finish old habits and make a fresh start, and realise the world is full of new opportunities. Imbolc is a time of optimism and for making new plans for the sunny days ahead. Plant the seeds of your plans now and tend them so they mature into your hopes and dreams. Now is the time to renew your New Year resolutions. Like many Celtic festivals, the Imbolc celebrations centred around the lighting of fires. Fire was perhaps more important for this festival than others as it was also the holy day of Brigid (also known as Bride, Brigit, Brid), the Goddess of fire, healing and fertility. The lighting of fires celebrated the increasing power of the Sun over the coming months. For the Christian calendar, this holiday was reformed and renamed ‘Candlemas’ when candles are lit to remember the purification of the Virgin Mary. Imbolc is still a special time for Pagans. As people who are deeply aware of what is going on in the natural world they recognise that there is strength in cold as well as heat, death as well as life. The Horned God reigns over the Autumn and Winter and although the light and warmth of the world may be weak, he is still in his power.